Stopover at La Trinité sur Mer, the ideal destination for camping in South Brittany! Nestled in the heart of the bay of Quiberon, La Trinité-sur-Mer combines the charm of an authentic fishing village with the tranquility of a family seaside resort in southern Brittany. 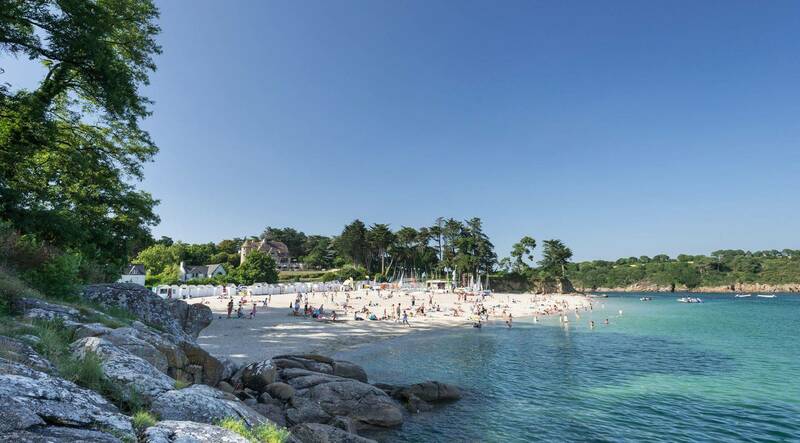 Famous throughout the world for its marina and water sports competitions, La Trinité-sur-Mer is a perfect destination for a pleasant camping holiday in the Gulf of Morbihan! Built high above and overlooking the port, the village of La Trinité-sur-Mer has managed to preserve the authenticity that gives the charm of Breton villages: typical architecture and narrow alleys to protect itself from the wind, fishermen's houses with dry stone walls and small islands of flowered gardens.... To discover the area, take rue de la Vigie, the highest point in the village; ruelle des Guetteurs, where customs officers once monitored traffic from the sea; rue de la Caserne and its "captain's houses". You who are looking for character and authenticity, this is the place to stop! The marina, "The Mecca of Sailing"
With 1290 berths at quayside, La Trinité-sur-Mer is the third largest port in Brittany and the fifth largest on the Atlantic coast. Nestled at the bottom of one of the most beautiful rias in southern Brittany, the marina of La Trinité-sur-Mer has been enjoying happy days since the late Eric Tabarly dropped anchor in 1964. The same year, he won the second edition of the Transat on board the Pen Duick II built at the Costantini shipyard in La Trinité-sur-Mer. From then on, the Breton port engraved its letters of nobility in the world of ocean racing and became famous throughout the world! Today, the port of La Trinité-sur-Mer is home to thousands of yachtsmen and the largest multihulls that are preparing for round-the-world races. It is also the scene of numerous nautical competitions and offshore regattas along the coasts of southern Brittany and the Ponant Islands. For those who aspire to take to the sea, the port of La Trinité is also an ideal starting point for a cruise on the Gulf of Morbihan, Belle-Île-en-Mer, Houat and Hoëdic. If you are looking for a holiday rental to enjoy your stay by the sea, we recommend the Camping 4 étoiles Kervilor, its modern and comfortable mobile homes, pitches to accommodate your tent, caravan, camper van and its heated indoor swimming pool to swim in any season. Organised by the Société Nautique de La Trinité-sur-Mer since 1978, the Spi Ouest-France takes place every year during the Easter weekend. The four-day event brings together nearly 500 boats and 3,000 amateur and professional sailors in Quiberon Bay. It is the largest gathering of habitable monohulls in Europe! For the occasion, many activities are offered on the quays throughout the race: giant wooden games, culinary workshops, children's entertainment, concerts, sound and light shows and fireworks on the old port.... Don't miss it if you are camping in Morbihan in April! A fine sandy beach facing due south, supervised in summer, with a beach club for children! For many campers, this is the most beautiful beach in La Trinité-sur-Mer. Our favorite for the holidays? The Camping 4 étoiles de la Baie avec son accès à la plage ! Take part in a guided tour of the salt marshes and follow in the footsteps of the salt worker who collects "white gold" in the heart of a 25 hectare protected natural area, the northernmost salt marsh in Europe! Linking La Trinité-sur-Mer to St Philibert and Locmariaquer, the Kerisper Bridge is a civil engineering structure built in 1901 by Gustave Eiffel, destroyed by the Germans in 1944 and rebuilt in 1956. It offers a unique view of the marina and the Crac'h River. The alignments of Le Petit Ménec, the covered alleyway of Mané Roularde or the dolmen of Kermarquer, to name but a few, are among the 18 megalithic sites listed as historic monuments in La Trinité-sur-Mer. Notice to hiking campers! The Customs path starts at the foot of the village, beach to beach and reaches the tip of Kerbihan where a magnificent view of the bay of Quiberon awaits you!